Considered one of the most influential theatre practitioners of the 20th century, Polish director Jerzy Grotowski revolutionized contemporary theatre in multiple ways. Perhaps best known for his notion of ‘poor theatre,’ Grotowski went beyond the confines of conventional theatre to systematically explore the possibilities of the human being in a performative context. 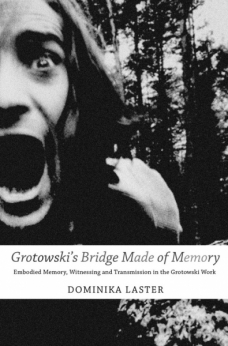 In Grotowski’s Bridge Made of Memory, Dominika Laster analyzes core aspects of Grotowski’s work such as body-memory, vigilance, witnessing, verticality, and transmission, arguing that these performance praxes involve a deliberate blurring of the boundaries of the self and other. This comprehensive study traces key thematic threads across Grotowski’s research, examining lesser-known aspects of his work such as performance compositions structured around African and Afro-Caribbean traditional songs and ritual movement as well as textual material from the Christian Gnostic tradition. As an active process of research and questioning conducted through the “body-being” of the performer, Grotowski’s work represents a practical realization of the often highly theoretical and abstract discussions of one of the field’s main preoccupations: embodied practice as a way of knowing.